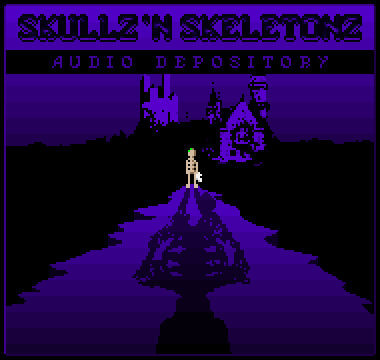 Welcome to the devlog of Skullz 'n Skeletonz! This game's a surreal Choose 'n Pick Adventure set in it's own unique world filled with spooky 'ol skeletonz, and you, a skull. Your goal is essentially to make sense of your situation which will become more and more apparent as you progress through it's (eventually to be) 10+ chapters. The game will be split into two parts, with your actions and decisions in one part influencing the situations you face in the other. Unlike most Point 'n Click's, this game is controlled solely by keyboard input, with you picking your actions from the textbox at the bottom, hence the term Choose 'n Pick. That's not the only thing to set it apart from your usual Point 'n Click, though. There is no inventory to speak of, even though you'll be gathering and using items left and right, your view isn't locked to the same third person view for the entire game and you'll be having bossfights. This game is effectively the sequel to the first game I've ever made, called Skullz, and has been in on- and off development for about two years and I'm more determined than ever to make it the greatest game I possibly can and eventually release it to Steam Greenlight and a couple other platforms. That's why I've been revamping this devlog as well by making a new thread for it, as the old one had a pretty rough start on my end. I hope that's okay, moderators! That's all I got for the time being. I'll leave you with some links if you wanna delve deeper into the happenings of this project. Here's also a link to the messy old devlog. It looks nice! I like the dark pixel graphic style. Maybe the screen movement is unnecessary in the third animation but I like this kind of games if the options are interesting. Is there going to be some dark humor on it? By animation, do you mean the portrait sliding in? That does get a little much after a while, I might speed it up except for some special situations. There is definitely some humor to this game, but I don't know if dark would be the way I would describe it. I was talking about the screen shake when the portrait gets in and out, but it’s just an opinion. And yes, maybe "dark" humor isn't the best word but somehow it remembers me to Murray in Monkey Island 3 or the skeleton brothers in Underworld. You're right on the money there! Murray is exactly what you can imagine this guy like. There's even a commented out piece of dialogue in one of the game's scenes referencing him. So yeah, lots of that. Indie game developer from Melbourne, Australia. Looking cool, I love the 1-bit style. Keen to see the progress! Posting to follow, love the visual style! Right now, our protagonists are at these crossroads. I'm not planning to spoil the entire game, entry by entry, but for these first couple updates I think it wouldn't hurt to set the stage and outline the game by following it's fictional chronology for at least a little bit, keeping in mind that this first prologue chapter is eventually gonna be put out as a demo to a broader audience before releasing the game proper anyway. These crossroads are also already being preceded by a handful of other scenes that I won't go into detail about now, so I think it's safe not to worry about being robbed of any fresh eyes you might eventually be laying upon this game just by keeping up with whatever's gonna be exposed right here. Anyway, we're obviously being presented with four directions to eventually wander off to. How you're going to get Yendor, the skeleton carrying you around, with your player character being the skull he's holding, to actually start shuffling down any of those paths is one of these mysteries (It's not much of a mistery) I'll be sprinkling about this devlog to not waste any precious novelty to these types of puzzle situations. Though, presenting the player with a branching path like that right from the get-go is what I hope will help make this game very interesting to play and replay, as not just one of them will be right, with the other three being wrong or unavailable, but all of them will be a viable choice. This is the first thing I wasted a lot of potential with (but also cut down a lot of development time) on the predecessor, where you were constantly presented with a number of choices but got nothing except jokey answers on all but one, which did have it's charm, but only once. So with that, we're about to be visiting one of three different locations, and I think that might've been enough words for now. If you're more into looking at pretty pictures, feel free to check out my twitter where I'll be talking less and showing more, in a less refined and more frequent manner, especially stuff that might not ever make it into the final game or even this devlog. Oh, it's all very dead. Nothing's alive in here! Just a couple skeletons shuffling through the void. Sooo....is the project still alive? I realize the "R.I.P." icon is a great fit for the theme of your game, but that icon has a very specific meaning on here: the project is dead. It is often used to allow members to skip over the dev logs of a game that has been scrapped so we don't have to pine for what could have been. You could lose quite a few eyeballs for a pretty small forum aesthetic. The project looks great, though. Some of those animated gifs really give a strong unsettling vibe. The one in the lower-right of the original post I could almost envision having a well in the middle with Sumara clawing her way out. With last week's screenshot update already revealing one of the destinations these crossroads'll be leading us to, namely Bedlam, which will be the subject of Devlog entries to come, let's take a look at where the other ones'll take us. A cliff and a forest, places that might be familiar to players of the original and give me a chance to tell you of this game's relationship to it's predecessor, which had you start on a cliff and end up in a forest not long after. Basically, Skullz 'n Skeletonz will serve both as a sequel and a prequel to Skullz, with the core storyline of the latter being left intact but refitted to and retold during the new storyline that is now expanding around it. While Skullz was strictly linear, Skullz 'n Skeletonz will be all about making choices, and the locations presented so far already start reflecting that, with this abstract line in the void, which would've taken you from the cliff to the woods in the original, now being retconned to not have ever been anything but our good old Crossroads, turning a linear path into a branching one quite literally. That's it for this weeks update. Next up, we may be actually finally arriving in Bedlam. Hello! There hasn't been another proper update yet since I've been having a bunch of critical ideas that aren't done developing yet. I've been posting some WIP stuff on Twitter along the way which I'll be dumping here to tide things over until the next proper post. This has such a strong atmosphere, it's pretty incredible. Good work man. Not exactly a breathtaking amount of progress, considering the long silence preceding it, but it's something! That's Bedlam, the initial destination of Yendor, and setting of the game's first chapter. Considering the current state of the project: I've been kinda carelessly hacking away at the code just before coming to a grinding halt considering creative output as the weather got unbearingly cold around here one month ago. Now it's starting to warm up a little and I'm left with a sea of messy code as well as scribbles and notes flying about wherever, but also the energy to distill them to a refined product. I'm hoping I can get back to weekly updates right away from this point forward. In the meantime, have another mockup starring Hugo, a life-sized skeleton that has been moving in with me recently. it's unthinkable to me that this is the title of an adventure game and not a mobile ghosts n goblins clone. but it looks far more interesting. I almost feel like I gotta open the game with a faux Ghouls'n'Ghosts sequence to not disappoint anybody coming in with that connection in mind all too drastically. Working on figuring out how to create this city as I have it in my mind. This'd be the first screen after walking through that gate from the last post. Wanna transition to a purple palette for the bulk of the city, trying to figure out how and where to transition the palette still. Also working on adding a scene with stuff to do inbetween arriving at Bedlam and the crossroads, cause ain't much to that whole snow area yet. So basically, trying to get that Chapter 1 up and running!